October 1st is International Older Persons Day. It is the annual celebration of Older People promoting the benefits of living an active lifestyle into later life. Unfortunately, the ageing process is an inevitable one and begins from our late 20’s. With these changes the risk of falling also increases with 1 in 3 people over the age of 65 falling each year, increasing to 1 in 2 over the age of 80. However, there are simple steps we can take to prevent being one of these statistics. The benefits of exercise are well proven for all sorts of physical and mental health issues. 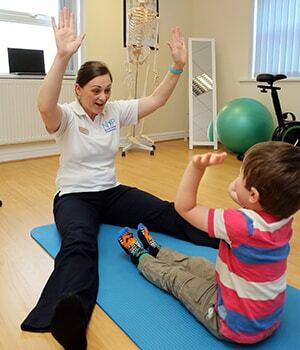 Regular exercise improves and maintains joint flexibility, strength and co-ordination. Whether this is a walk, a visit to the golf course, yoga or Thai Chi or even a few exercises in your own home. From your biceps to your stomach muscles to your pelvic floor – all your muscles can be trained up at whatever age. But it can be daunting to know where to start or how to progress if we are concerned about our bodies. The Chartered Society of Physiotherapy have produced a booklet alongside Saga, full of advice and a straight forward exercise programme that anyone can do at home. These exercises target the main muscle groups to help prevent falls and improve our balance. What factors help us to stay healthy in later life? What steps can we take to reduce our chances of falling? These, and other top tips, are shared in the Chartered Society of Physiotherapy’s free booklet Get Up And Go. To obtain a copy visit the above link or visit us at our clinic where you can also get your ferrule on your walking aid checked and replaced if required. 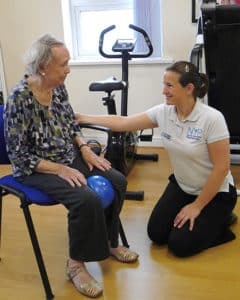 For further advice and information please do give us a call at North Yorkshire Physiotherapy on 01642 205975 or ask about our popular Older Person’s Class run by experienced physiotherapist Hannah Holloran. We also provide one to one sessions for those concerned about their mobility and Director, Kate Bye, presents “Live Long, Live Well” to groups.